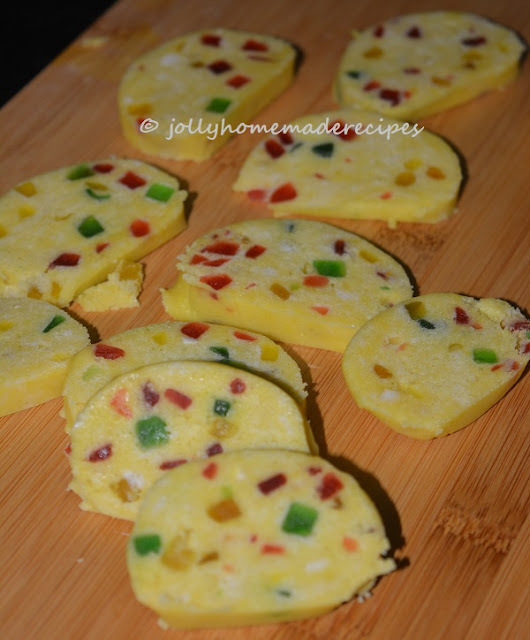 Eggless Tutti Frutti Cookies with step by step photos recipe - How many of you like the bakery style biscuits like tutti frutti ?? 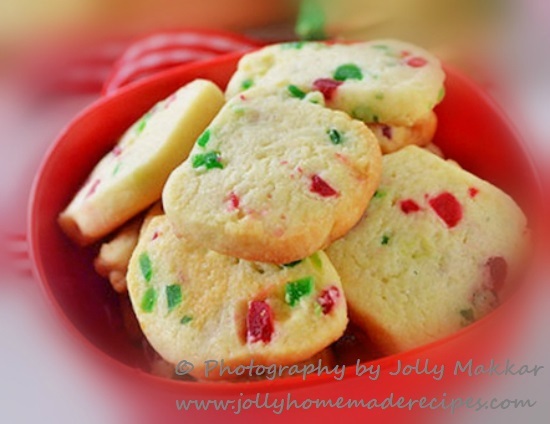 Tutti Frutti cookies are typically Indian style biscuits which are heavily flavored with nuts and tutti frutti. These cookies are also called Karachi Biscuits. 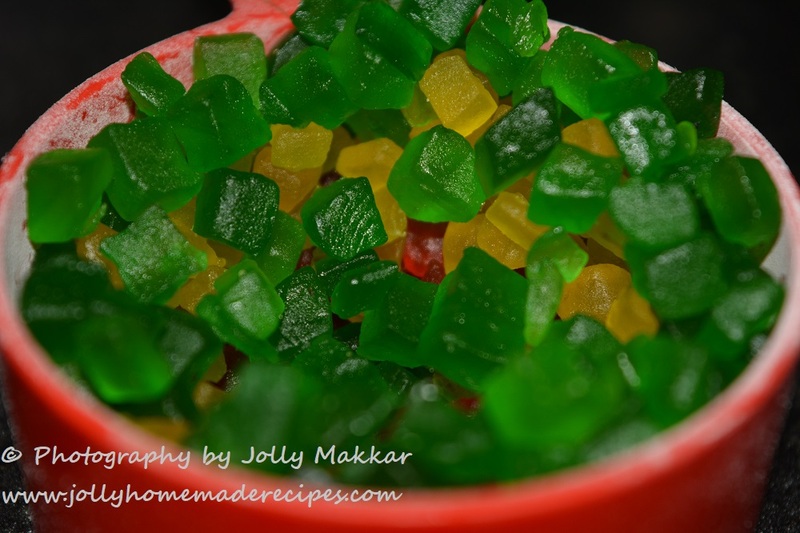 They are crunchy and rich cookies that are very popular in Hyderabad. As Diwali is nearing, you can include this easy peasy cookie recipe in your festive menu.With just few ingredients, you will get your fresh home baked cookies and it tastes awesome! It can be done under 45 minutes. It's a popular tea time cookies and is easily available in most bakery shops in India. 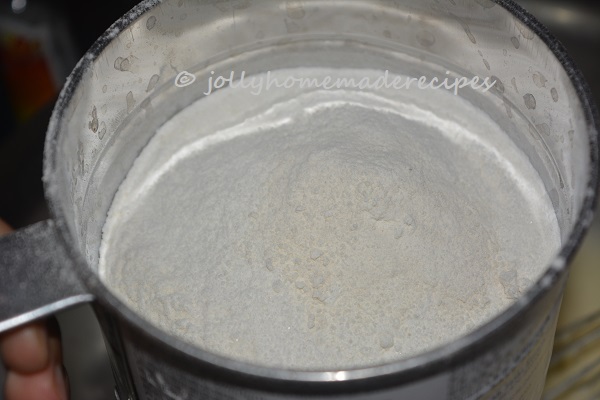 Super easy fail proof recipe that has been tested and tried in my kitchen. 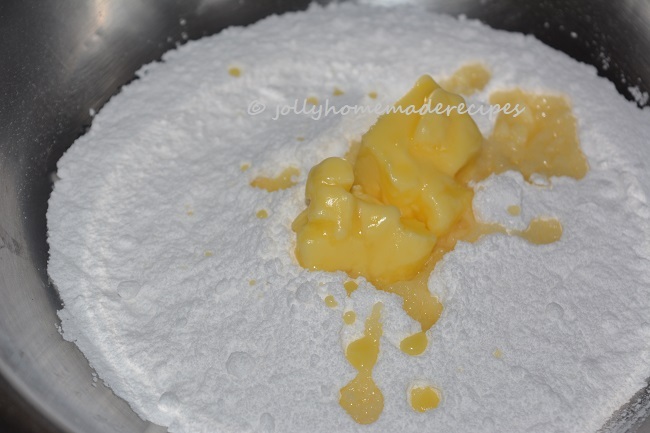 This recipe is one among the several to try baking list for long time. So I tried it and everyone loved it !! Although cookies or biscuits will be easily available in your nearby supermarkets or shops but the one’s you make yourself at home taste even sweeter. Be soft and gentle with them and they will be softer and more tasty !!! 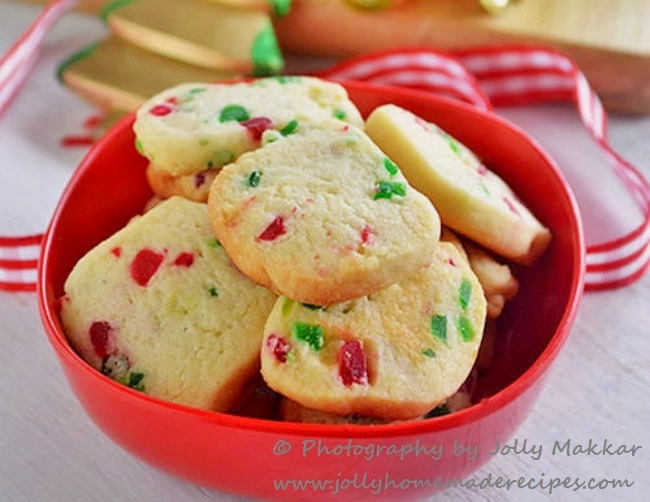 Let's start to make this easy and quick recipe of tutti frutti cookies with simple step-by-step process with photos. 1. 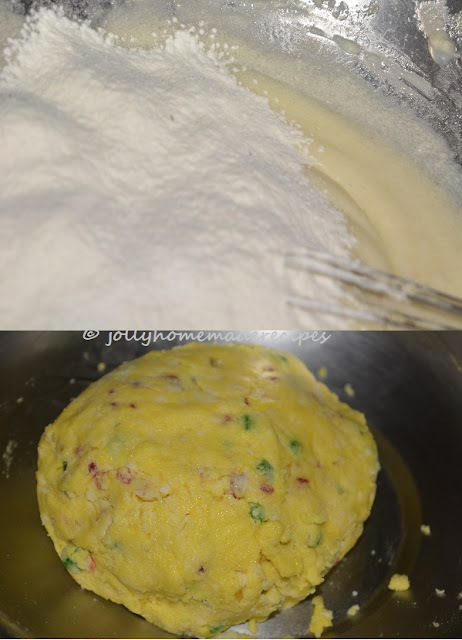 To prepare Karachi Biscuits, in a large mixing bowl, sieve in all-purpose flour and custard powder and mix well. 2. Add in roughly chopped cashew nuts and tutti frutti. Mix well. 3. In another mixing bowl add butter and powdered sugar. Cream the butter and sugar well by whisking and then add in milk. Whisk everything together. 4. 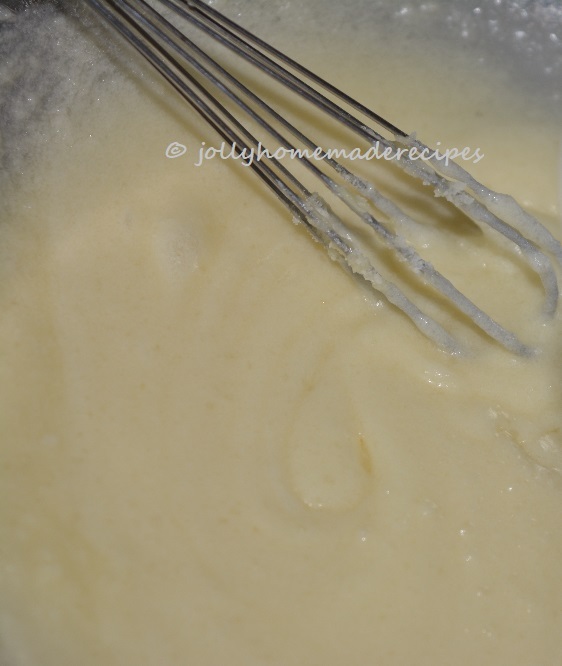 Once the milk, butter and sugar are well combined, add prepared mixture of flour, custard nuts and tutti frutti, in batches. Make sure there are no lumps. 5. Add a little milk if you feel that the dough is too dry. 6. 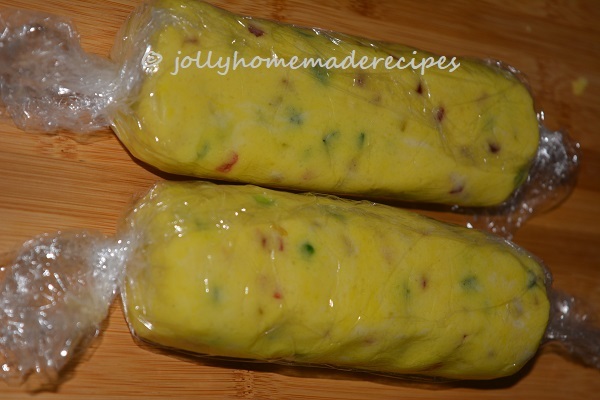 Roll the prepared dough to form rectangular logs or any desired shapes and cover it using a cling wrap and freeze it for about 15 mins or until it become firm. 7. Meanwhile, preheat oven at 180 Deg C. Once firmed, remove cling wrap from the dough and cut into even sized biscuits. 8. Arrange cookies to be baked on a baking sheet with 1 inch gap in between and bake in preheated oven for about 15 minutes or until the cookies start darkening in color. 9. Once the completely cooled store tutti-frutti cookies in airtight containers and enjoy with Chai or coffee. 1. Baking time may differ from oven to oven so keep a check on the cookies after 12 mins. Hi Jolly, it's been long time.. First I thought it's idli.. Superb dear.. 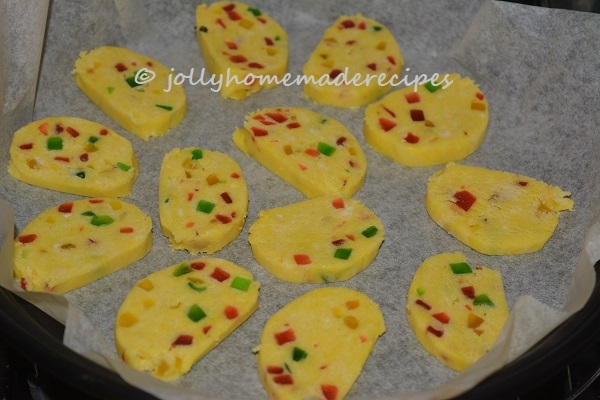 Cookies looks yummy and really tasty..
Hi dear, I saw your post or "EGGLESS TUTTI FRUTTI COOKIES | KARACHI BISCUITS RECIPE | FRUIT COOKIES", This is really nice and useful post. Thanks. I simply adore Karachi biscuits. i love the little speckles of tuti fruiti and I love homemade biscuits. Very cute and colorful cookies. Kids will be so thrilled to have this for snack! These are from my hometown.. I have grown up eating these delicious cookies. Perfectly made Jolly. 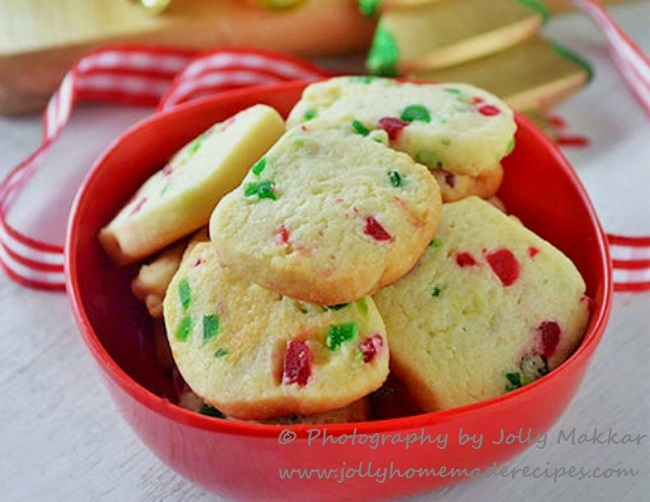 Love Karachi biscuits and this recipe sounds so tempting lovely share . I miss tutti frutti :( Love Karachi cookies as they look so pretty like little jewels studded in the cookie. Haven't made them in a long time. These are my favourite cookies form Karachi bakery in Hyderabad...I miss them so much her..So, try to make them at home,,,haven't made them in a long time...thanks for reminding...you cookies look so perfect...I'm sure they tasted great!! Karachi cookie with its unique smell and flavour captures the brain immdeiately. Love your recipe. We used to love those cookies when we were kids, love the perfectly baked cookies with the tutti frutti peeking on top. Karachi cookies are an absolute family favourite, especially with my nieces and nephews because they are so colourful. This eggless version is something I must try. Love these karachi biscuits, they are delicious. Your version looks so good. Nice share. Looks like my comment did not go through. Just saying call me over for chai. Will love to munch on these.